Now in its second edition, attorney Branca’s book is among the most valuable tools available for those who are serious about protecting their families and themselves. Sure, there are other books on the legal aspects of self-defense but a couple of elements set this one apart. First, is how it’s organized- The opening chapter presents a plain-language orientation to the criminal justice system. This provides the context for all the information to follow and that is absolutely critical. Understanding the legal terms and definitions is only half of the battle: how those things will be applied to you…in the aftermath of a violent encounter…is likely much more important. Branca knows this, and makes sure that we know it too. “WARNING!!! READ THE ENTIRE BOOK!!! DO NOT JUST FLIP STRAIGHT TO THE BY-STATE GUIDE!!! IT MAKES MORE SENSE IF YOU READ THE ENTIRE BOOK!!! As if this weren’t enough, there are chapters on defense of property and defense of others, too. The book concludes with “Crafting a Legally Sound Strategy” so that you can make good decisions with all of the information you’ve just read. Spread throughout the book are synopsis examples of actual self-defense situations and their outcomes. These sometimes very moving accounts are used to illustrate how theory is applied in reality, and serve to put a human face to the legal information. Andrew Branca writes with clarity and a refreshing sense of humor. He knows his subject better than most of his peers, but never forgets that this book is for you- the student of self-defense- because that’s what he is, too. There are numerous books available on this topic and I’ve read most of them. 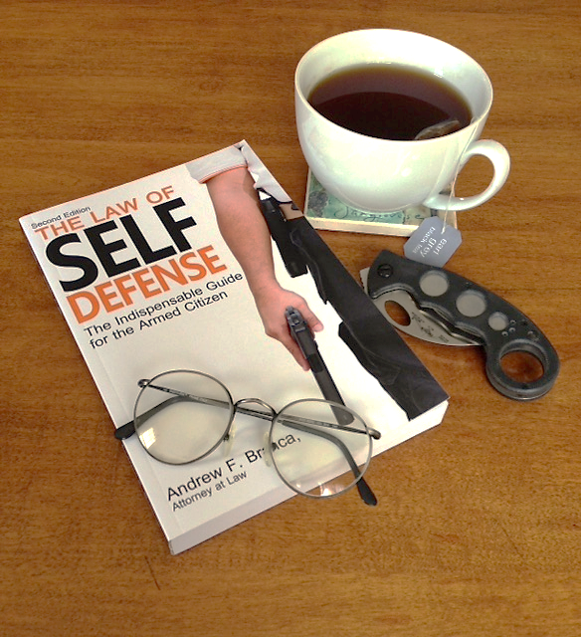 But if I were asked to recommend just one…Andrew Branca’s “The Law of Self Defense” would be it. And thank YOU for the great read.